1.Made of plated alloy, crystal, imitation pearl and elastic ribbon, this vintage style headband takes your 1920's outfit up a great notch,A stunning brightness with a beautiful and elegant design. 1. 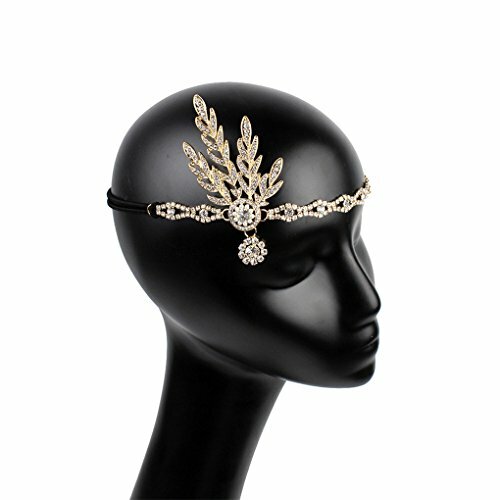 You can use this 1920s flapper headband with a Cigarette Holder, earrings, bracelets to attend 20s party. 2. You can also wear in normal life, it is suitable for any elegant clothing. Wear this mesmerizing accessory on, give a little swaying dance and get lost in the magic of the roaring twenties. Besides a photo of unforgettable moment in the flashing light, you could also save this special headpiece for durable and long lasting memory after spending a glorious evening. If you have any questions about this product by Countonme, contact us by completing and submitting the form below. If you are looking for a specif part number, please include it with your message.